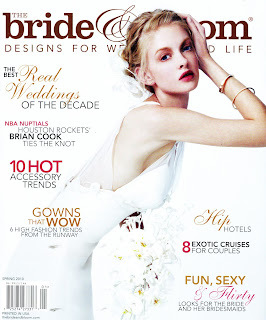 I was so excited when I found out I had been chosen as one of three winners for a contest sponsored by The Bride & Bloom magazine in February 2010. Winning the contest meant that I would get help registering for our wedding and with interior design. The magazine's editor asked that I comprise a storyboard of inspiration, pictures of our master bedroom, and a complete layout of the room. After supplying all these things within 48 hours, I waited, and waited, and waited. After several emails I found out that Thom Filicia from Queer Eye for the Straight Guy, Dress My Nest, and Tacky House, would be helping <K> and I with our decor for our Master bedroom. What a blessing?!?! Putting together my registry went from an overwhelming task to a much-anticipated adventure! Thom's publicist and PR company sent up a phone interview for us to discuss <K> and I's vision for the room. I hung up after the 15 minute conversation with the anticipation that we would be speaking again shortly. I would like to digress slightly and note that Thom and his entire team were friendly and helpful. They were a pleasure to talk to and were ready accessible via email when I had questions. That being said Thom's team later informed me that they sent all of Thom's recommendations to Bride & Bloom magazine and that I should call them if I had any other questions. And so I emailed the editor inquiring about the contest. I was informed that the magazine was compiling the information and that I would be hearing from them shortly. That was over a month ago. I hate to be a bother, but I once again emailed the editor to follow up, but to no avail. I received no response. So then I decided to some action, via twitter I tracked down the other two winners, who were also disappointed by the lack of response from the magazine. As their weddings fast approach it seems there is little the three of us can do at this point. However, I have composed an email and solicited the other winners to include their point-of-view. I plan on sending that email to the magazine, not in hopes that they rectify their lack of response and diligence, or fill any false promises they've made, but in hopes that no one else enters their contests with any hope of receiving anything in the future. Let this be a warning to all you unsuspecting brides.... the Bride & Bloom magazine may be filled with beautiful pages of fairy tale weddings but if you win a contest, it means virtually nothing.